UVB - Lamps > FACT! 92.4% of UVB patients get better after 2 weeks of treatment! FACT! 92.4% of UVB patients get better after 2 weeks of treatment! UVB lamp usage has brought psoriasis treatment and vitiligo treatment to new heights. Its effects are proven by numerous experiments and thorough research. This kind of phototherapy utilizes narrowband UVB light of the 311 Nm that have a great effect on the skin on the cellular level. – UVB light is proven to give an incredible psoriasis relief, there’s no doubt! – Home treatment with UVB lamps keeps vitiligo at bay – guaranteed! – Convenient and efficient home UVB phototherapy – a few minutes a day to cure your skin. – Dermatologist appointments are in the past – now you can effectively treat yourself at home! – UVB lamps are completely safe to use if you adhere to the manual. It’s true, that you can’t cure some skin disease completely. But it’s the symptoms that ruin your life, so the solution is logical – get rid of them. Narrow Band UV radiation is proven to fight the symptoms of psoriasis, vitiligo and other not-very-pleasant skin problems. You might have known that, but did you realize that UVB spectrum light is 92% efficient at removing any trace of the disease from your skin? Spending just a few minutes every day at home, while watching cable or reading, you can almost cure yourself! It’s not a secret or the latest research – just something the doctors don’t want you to do, because it makes them lose the appointments money. UVB lamps – safe, effective and convenient! If you have skin problems – it’s time to make the right decision and discover the therapy you need! We work directly with the manufacturer, so your UVB lamp will be totally brand new! Our company works with the most convenient parcel services – TNT, FedEx, USPS Express Mail, usually takes 4-7 business days for worldwide. For the best delivery speed 3-5 business days for the US and Canada we’ve got a warehouse in NY. If you’ve received a lamp that’s broken during delivery or was initially defective – contact us and send it back to the address we’ll post. It will be either refunded or another one will be sent. If you are not satisfied with your product, you can return it to us. A 15% restocking fee will be charged, and shipping costs are your responsibility. 4. Ask about the one year guarantee! Every product, except for changeable UVB bulbs is susceptible to a one year guarantee! Even though people may know that psoriasis and vitiligo aren’t contagious, they still feel uncomfortable when communicating with a diseased person. That makes the latter even more uneasy, doesn’t it? The same goes for all those doctor appointments and clinical treatment. “Hey, wanna go bowling tonight?” – “Umm, no, I’ve got a dermatologist appointment tonight…” How lame does that sound, huh? Just get yourself a UVB lamp and spend a few minutes a day to get rid of all the symptoms. You won’t believe your eyes when in half a year you’ll see the wonderful results of home phototherapy! Clinical studies around the world have shown that Philips Phototherapy lamps are the most effective lamps currently available for the treatment of Psoriasis, Vitiligo and other skin diseases. People just like you know that it works! People say UV radiation is bad for your health. Is UVB phototherapy safe? It is as safe as you make it. As long as you use the lamp according to the manual and do not exceed the maximum time of exposure – there’s absolutely no chance of your health being damaged. Your safety is in your own hands as well as the treatment itself. Is home therapy as effective as clinical one? Pretty much so – the principle is quite the same. The only difference is the fact that you can sit at home in a cozy armchair or sofa and treat your skin problems instead of having to go somewhere and pay for the appointment of your doctor. 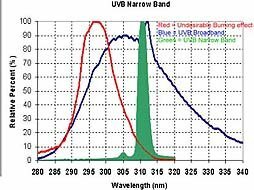 How do I use my UVB lamp? Contact us at uvblamp@gmail.com and ask for a complete manual. It’s easy and quite comprehensive – even a child would have no problems using it. 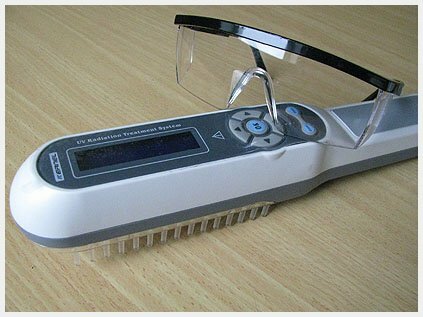 Which diseases can you treat with a UVB lamp? Basically, it’s effective against most pigmentation problems, but the best efficiency is reached when treating psoriasis, vitiligo and atopic dermatitis. You’ll have a chance to remove more than 92% of symptoms in the best case. Well, UV light is still quite dangerous for underage patients. It may cause carcinoma or melanoma in immature child skin. In any way – it’s okay to use the UVB lamp from 12 years old. Contact us with any question you have. We’ll try to give you a prompt response and tell you everything you’d want to know.